That special day is something you'll want to remember and treasure forever. 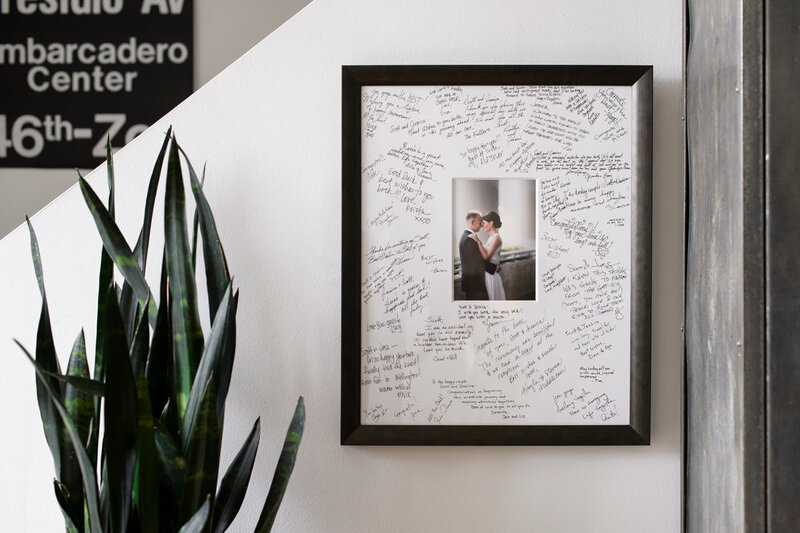 From the dress to the invitation to the ketubah, there are limitless ways to frame the love. Instead of stashing it away in the back of your closet, why not say yes to framing and displaying the dress you put so much thought into selecting? We'll help you choose all the right archival materials and provide tips for the ideal spots to display it (tip: avoid direct sunlight). Before framing, you'll want to take your dress to a professional cleaner to remove any stains or wrinkles. If you are in the Chicagoland area, we recommend taking the dress here. Go behind-the-scenes during a wedding dress framing and get more tips and ideas on our blog. First of all, yes! We know what a ketubah is. Secondly, we have experience framing thousands of ketubahs over the last 40 years. Each one is unique, completely irreplaceable and a work of art that deserves the finest custom framing. Before the ceremony, we can mount and cover it with protective mylar so it's presentable and sign-able. After the ceremony, we'll find the right frame that is just as special as this sacred symbol of your union. From first date mementos to proposal keepsakes (like the champagne cork), we can help commemorate all the milestones leading up to the big day. And as the wedding day comes and goes, cherish those special items it took you months to plan by framing everything from the invitation to the guest book to the flowers. Framed photos also make wonderful thank you gifts. Not to mention, our gift cards are the perfect option for wedding or shower presents so the couple can treasure the day's magical moments for years to come. See the artistry that goes into framing, check out our FAQs, contact us or visit either of our locations to say I Do to wedding framing.